As well as teaching online private English lessons to Spanish students, I help some French students at beginner level. As you may already know, I am a big fan of Martina Bex and I decided to use her storytelling unit for French 1: Dit. It is working great with my students who love the repetitions of the key structures: “c’est, un garçon, une fille, s’appelle, dit, je m’appelle, il / elle est ….” and the use of many cognates to describe people: “énergique, stupide, bizarre ….“. There are loads of cognates and comprehensible input and the students have fun inventing names, jobs and personalities for each character. It is still too early to say, but I am confident it will help them improve their French. I also created a communicative activity to go with this unit based on Martina Bex’ communicative game¿Qué te gusta?. The goal is to practice the key structures: ” Je suis / Tu es ….” and to understand the concept of masculine and feminine adjectives. Students can do this activity walking around to classroom (which always gives them a chance to get moving a bit!). 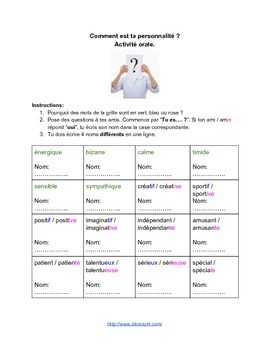 Using the adjectives on the handout, one student asks another student “Tu es calme ?”. If that student answers “oui” then he/she can write his/her name in the “calme” box. Students can stop the activity when they have 4 different names in a row. Along with the activity sheet itself, I have included instructions for the teachers and some follow-up ideas which would make students practice their writing skills too. You can find the document entitled: “Comment est ta personnalité ? Activitié orale.” here which you can edit to suit your own needs. (Of course you can also download it for free on Teachers Pay Teachers along with other useful resources!). < Finding input which will engage English learners.